World Jewry 10 years out – what will it look like? Matthew Rojansky, from left, Director of the Kennan Institute of the Woodrow Wilson Center, and Jessica Brandt, Associate Fellow and Special Assistant to the President, at Brookings Institution, discuss what world Jewry could look like in 10 years with moderator Stephen H. Hoffman, President of the Jewish Federation of Cleveland. WASHINGTON – Are we seeing a repeat of the 1920s and 1930s that led to the Holocaust or is the reaction to world events overblown? 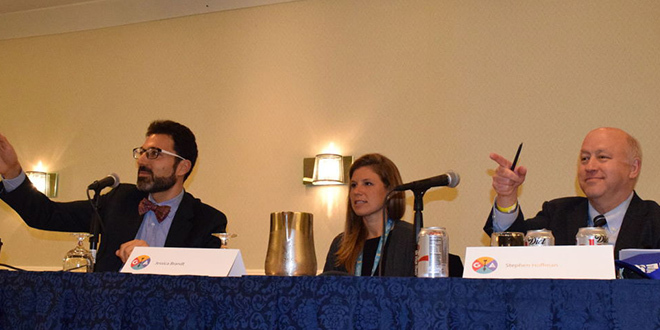 Stephen H. Hoffman, president of the Jewish Federation of Cleveland, moderated a panel, “Ten Years Out: The Future of World Jewry,” to a packed room Nov. 14 at the 2016 Jewish Federations of North American General Assembly at The Washington Hilton. Panelists were Jessica Brandt, associate fellow and special assistant to the president at Brookings Institution, and Matthew Rojansky, director of the Kennan Institute of the Woodrow Wilson Center. Dr. Linda Ketover, president of the Minneapolis Jewish Federation, introduced the session. Hoffman set the scene for the discussion, which helped to kick off day 2 of the JFNA GA. He recalled what a rabbi taught him 44 years ago when he was in graduate school, which is relevant today. “His theme was in Jewish history, in the history of the world, Jews thrive only on the very narrow place on the spectrum of the conflict between the left and the right. He would call it the Litmus test and we were OK as Jews only when the pH value was neutral. When the left was dominant and that was in the ’70s, represented by the Soviet Union and Communism, we lose. We lose big time. And when the right was dominant as in Nazi Germany and Fascist Italy and other parts of Europe, we lose big time. … In that neutral pH zone, I think it’s seven on the Litmus test, are we able as a Jewish community, thrive. … Where are we now on that Litmus test? All of that can have an impact on world Jewry. Hoffman described a recent visit to St. Petersburg that told a chilling tale. The concern was that they were being watched. While some Jews are happy living where they are, others may want to move but can’t for lack of funs or a fear of the unknown. So Hoffman asked whether an economic relocation fund should be established for Jews in Europe to assist them in relocating from one part of Europe to another.